“I’m about to have an uncomfortable conversation with y’all. I may turn red and become visibly emotional. I apologize in advance.” That statement is how I start almost every single one of my talks on anti-sexual harassment policies. I know that the topic is hard for many in the room to discuss, that I may trigger an unwanted response, either in the form of a repressed thought or a negative defensive emotion, at any point in that hour. I know that in order for those in the room with real power to hear about this topic, they need to see first-hand just how this unfortunate issue can negatively impact a person’s work, and their primary objective as a scientist. But I also know that for some people in the room, what they really want is for me to give them a hug and tell them it will be okay. I know that my words will have a direct influence on the audience and I must act according to the level of respect and understanding every single person in that room deserves. That’s not easy, and I know up-front that I have put myself into a position of responsibility. 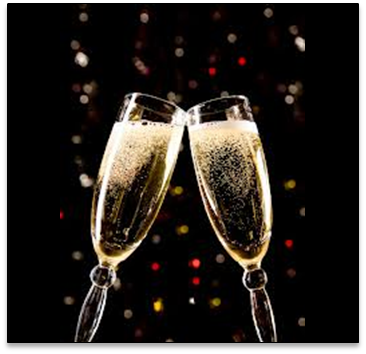 Today’s guest blogger is Rebecca Oppenheimer. 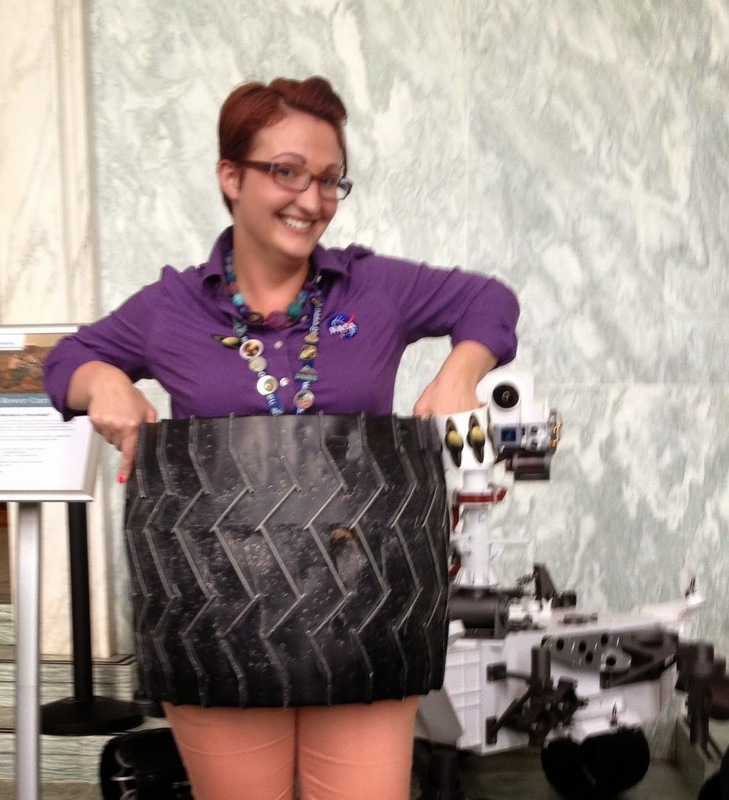 Rebecca is Curator, Professor, and Chair of the Department of Astrophysics at the American Museum of Natural History. Her optics laboratory in the Rose Center is the birthplace of a number of new astronomical instruments designed to dissect and analyze the light from a continuously growing population of exoplanets. I am a half-Jew, white, private-schooled, astronomer from the Upper West Side of Manhattan who loves exoplanets and pizza. I am quite certain I am not unique in holding all those labels. In fact I know a few others who do. Except I am also a transgender woman. Human beings have had a need, since Aristotle’s fundamental writings, to label and categorize everything. It makes it easier to discuss phenomena. 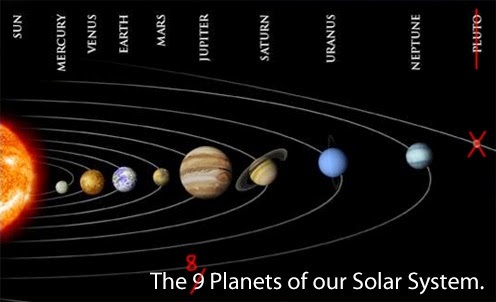 One might, for example, examine the contentious notion of whether Pluto is a planet. The word "planet" is so loaded that few even know what the word originally meant—a wanderer among the stars, the etymological meaning of the word from ancient Greek. Silicon Valley came under a lot of criticism last year for its seemingly grudging acknowledgement that it has a problem with diversity in its technical workforce. After a lot of pressure, many, but not all, major technology companies have released some data. Higher education also has a diversity problem -- several, in fact. An examination of MIT data on recruitment and retention of graduate students and faculty from underrepresented groups -- women and minorities in STEM fields -- gives evidence that positive efforts were yielding some successes, as detailed in a major report. These groups come under a lot of scrutiny, and to be sure, there is need for renewed efforts so that the talent available in more than half the population is developed and tapped more fully in academia. But it seems to me that all the light shone on graduate students and faculty has left other important groups struggling to read their career guides in astronomical twilight. Compared with graduate students and faculty, there has been near-silence on the diversity of postdocs and non-faculty researchers in academia. These positions are stepping stones to faculty positions or lead to alternative paths following the PhD. Yet some universities don't even know who their postdocs are -- there is often no central listing -- and the hiring processes that have served to provide equal opportunity for faculty may not be present for these other PhD positions. 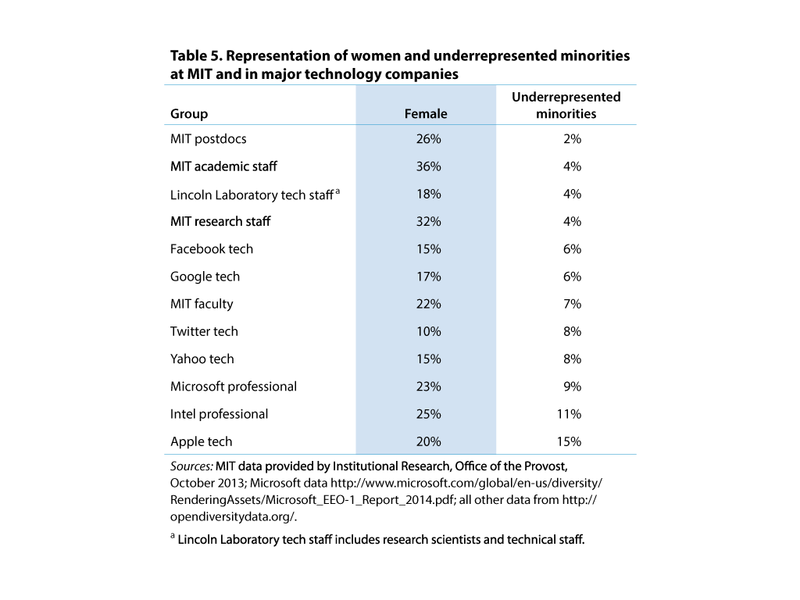 MIT has recently published data on the gender and race/ethnicity of postdocs, research scientists and engineers, and other academic staff roles that typically require a PhD (e.g., lecturers). The comparison with the technology industry is illuminating and worrisome. A few caveats: 63% of MIT postdocs but 41% of faculty in this data set are international. A significant fraction of the postdocs are in life sciences, where the majority of PhDs are awarded to women. Similarly, the MIT academic staff include many lecturers in humanities, who are preferentially women. So the data are not that easy to compare to the tech industry. Nevertheless, the trends are concerning, especially concerning the lack of Native American, Hispanic, and Black scholars. Surprisingly little is said about diversity in the recent NRC report The Postdoctoral Experience Revisited. The report references the NSF Survey of Earned Doctorates and refers to the NIH/NSF Graduate Students and Postdoctorates in Science and Engineering Survey. In Astronomy in 2013, this latter survey shows that of 407 postdocs, 8 are underrepresented minority (American Indian or Alaska Native, Black or African American, Hispanic or Latino, or Native Hawaiian or Other Pacific Islander). That's consistent with MIT's 2% for postdocs overall. Motivated by a New York Times article, I looked up a paper in the Journal of Psychology about a study done to assess bias in university professors. The results were based on a large blind audit of professors in various fields and were remarkable. In all fields except the humanities, professors systematically replied to correspondence from professors than students with white male names differently than students with female names or names suggesting non-white race. The study was performed by Katherine L. Milkman (U. Penn), Modupe Akinola (Columbia) and Dolly Chugh (NYU) and published on-line this year. E-mails were sent to a large selection of professors in 89 disciplines and 289 institutions The e-mails were from fictitious students expressing interest in a professor's research and asking for a short meeting during the student's visit to campus. The student names were chosen to suggest gender and race, such as Meredith Roberts and Raj Singh. A total of 6548 e-mails were sent to randomly selected professors. The result were that professors on average were more likely to reply to students with white male names than any other group. (E-mails were immediately sent to cancel any appointments with the fictitious students.) All e-mails were identical except for the names. With the students sight unseen, the bias in the thinking of these academics was revealed by value association based on names. 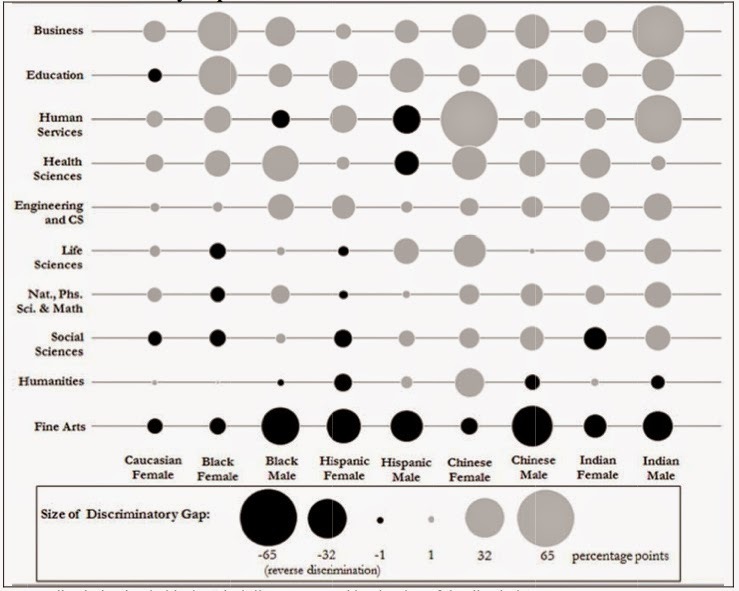 The results are shown in the figure (discrimination in grey and reverse discrimination in black) using percentages. The number of samples for each disciplinary category ranged from fewer than 200 to more than a thousand. There were 850 samples for the Natural, Physical Sciences and Math. The results are most striking in the disciplines of business and education at the levels of 10's of percent response differences and lower in the science disciplines at the levels of few percent. In fine arts, the bias was strongly reversed with professors replying systematically more to female and non-Caucasian students. The only field where there appears to be little of no bias is in the Humanities. 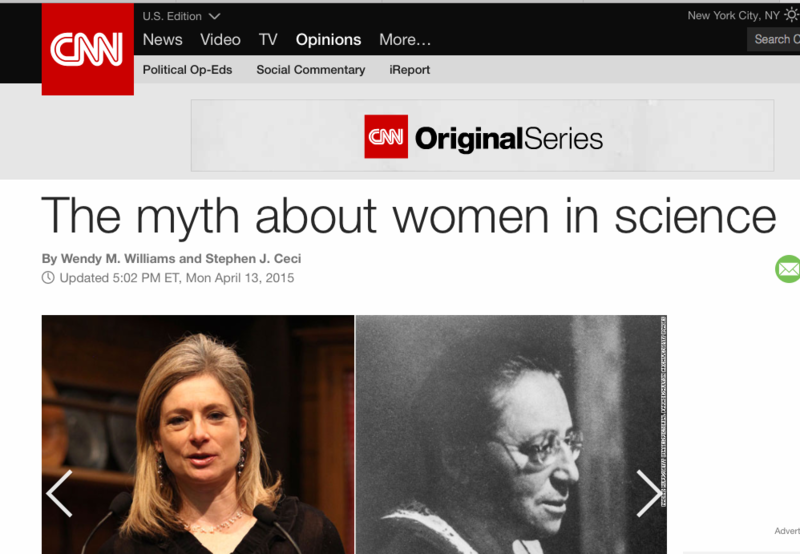 Screen grab from CNN for the OpEd by the authors of the PNAS study. When the Harvard University Department of Astronomy undertook a recent faculty search, the Harvard faculty asked applicants to submit a CV, a list of publications, statements of research and teaching interests, and to arrange for confidential letters of recommendation. The department reviewed these materials, selecting a half-dozen applicants for interviews. Each individual visited for two days, during which time they delivered a colloquium, and met with faculty and students, including several dinner meetings. The faculty then convened for several hours to decide on whom should receive the offer. Recent data on demographics and conversations with my NSF colleague, Lisa Frehill, opened my eyes to a somewhat surprising fact. Young women in astronomy (assistant professors, postdocs, students) from some racial and ethnic backgrounds (white and Asian) may have reached parity with their percentages in the US population! -Graduate enrollment for women in US astronomy departments has risen from 25% in 1997 to 30% in 2006 (NSF-NIH Survey of Grad Students and Post-docs in S&E). -The percentage of Astronomy PhDs earned by women in the US has increased steadily from less than 20% in 1997 to almost 30% in 2006 (NSF Survey of Earned doctorates). -The success rate of women in both prize fellowships and individual postdocs is about 30%. -The percentage of women faculty at stand-alone astronomy departments in 2006 was 28% at the assistant professor level. 5. There is crying in science. That's okay. Today’s guest blogger is Sabrina Stierwalt. Sabrina is currently a L’Oreal For Women in Science Postdoctoral Fellow at the University of Virginia. Her research uses multiwavelength observations of nearby galaxy mergers to understand the cosmological assembly history of galaxies. Her most current work focuses on low metallicity, merger-driven star formation and the subsequent enrichment of the ISM in interacting dwarf galaxies. Astronomy research funding through the usual NSF and NASA channels is shrinking to the point that some agencies have considered capping the number of proposals a scientist can submit. Other programs, like NASA’s 2015 Astrophysics Theory program, are being cut altogether. As a predominantly longer wavelength astronomer, I also don’t typically benefit from funds allocated with my telescope time since I rely on ground-based radio facilities as my workhorses. So as a postdoc on a (never ending?) quest to fund my research in the financial landscape before me, one thing became clear. It was time to get creative. That’s how I found the L’Oréal USA For Women in Science program. The inaugural Inclusive Astronomy meeting is coming up in less than three months: June 17-19, 2015 at Vanderbilt University in Nashville, Tennessee! This meeting is being planned in response to the reality that marginalized people face -isms and -phobias which function as barriers to their participation in astronomy. As organizers, we are excited for this meeting and hope that it will be the first of many. Establishing a community of inclusive practice. Each broad area will contain plenary presentations, breakout sessions, and workshops. Some of the topics to be addressed are: intersectionality between racism, ableism, cissexism/transphobia, heterosexism, and sexism; campus/workplace climate; accessibility; addressing harassment and sexual violence on campuses and in workplaces; allyship; strategies for developing bridge programs; developing the skills to influence astronomy policy; and the societal boundary conditions that impact work toward equity and inclusion in astronomy. The plenary presenters include Chanda Prescod-Weinstein on intersectionality; Kenjus Watson on creating inclusive environments; Lydia Brown on disability justice, autistic self-advocacy, and the intersection of ableism with racism; David Helfand on why policy matters; Rachel Ivie on demographics; and a panel discussion by Ebony McGee, Casey Miller, and Richard Pitt on science identity in students, problems with the GRE, and stereotype threat.